The oldest patent for an electric bike I've been able to find at the US Patent and Trademark Office is this one, by Ogden Bolton, Jr. of Canton Ohio, which was filed in September 1895 and granted three months later. You can see from these original diagrams that it bears an amazingly close resemblance to modern electric bikes. In the general picture on the left, you can see there's a hub motor on the rear wheel (blue), a battery suspended from the frame (red), and a simple handlebar control to make the thing stop and go. In the more detailed cutaway of the hub motor on the right, you can see there's a six-pole magnet in the center (orange) bolted to the frame and an armature (made from coiled wire, yellow) that rotates around it when the current is switched on. It's quite a hefty motor even by modern standards; Ogdon mentions "a heavy current at low voltage—for instance, to carry one hundred amperes at ten volts." So that's 1000 watts, which is about twice the power of a typical modern bike hub motor. Artwork: One of the first electric bicycles. 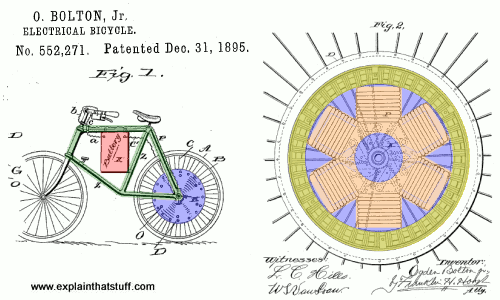 Two artworks from US Patent 552,271: Electrical Bicycle by Ogden Bolton, courtesy of US Patent and Trademark Office. Please note that we've colored the original artwork and edited it slightly to improve clarity.